We head to the Dutch capital for a three-day gastro city break to sample some classic eats and drinks. From apple pie and licorice to herring and craft beers, there is something for everyone. “Welcome to the Jordaan Food and Canal Tour,” says Eating Amsterdam guide Aileen Martinia outside Café Papeneiland (Prinsengracht 2) one crisp April morning. Just west of the canal belt and formerly a working-class area, the Jordaan is now one of the city’s most desirable and character-filled neighborhoods, packed with specialty food shops, cafés, and restaurants. 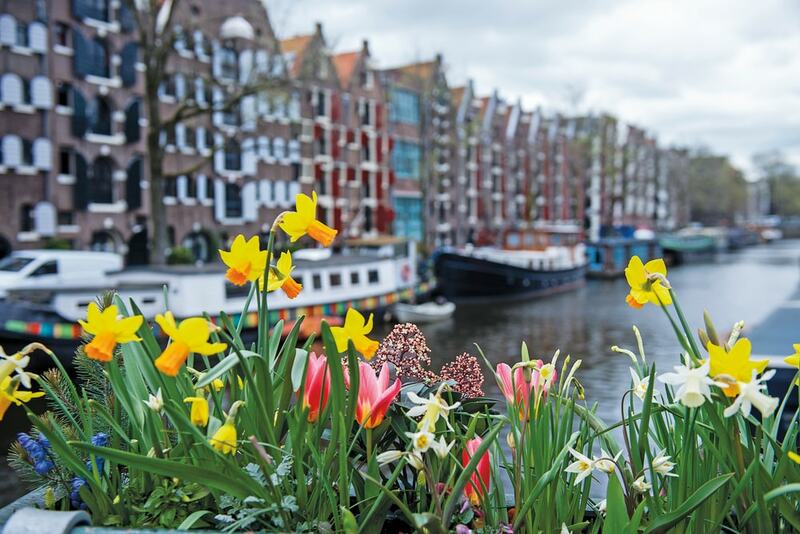 The four-hour tour provides an excellent initiation into Amsterdam’s culinary traditions, with uniquely Dutch tastings from several food vendors interspersed with entertaining facts and tales en route. Café Papeneiland is a great example of a traditional bruin café (brown café) and one of the oldest in the city, dating back to 1642. 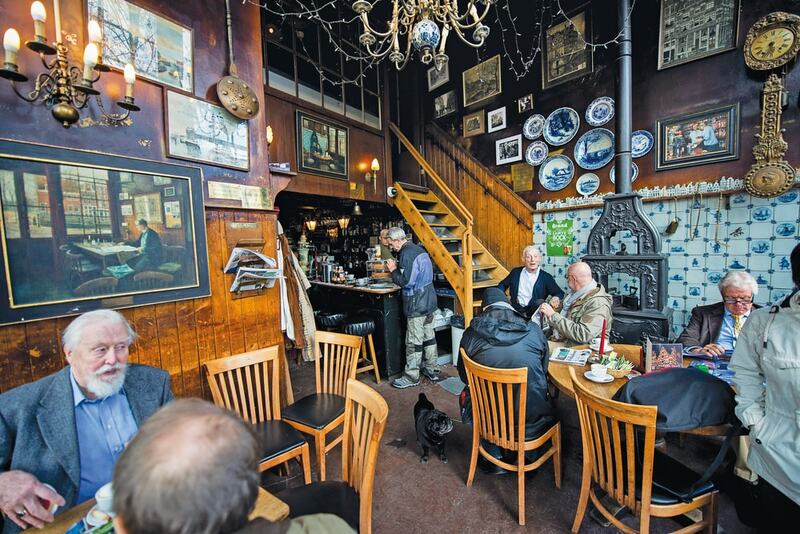 The term “brown café” comes from the dark but snug wooden interiors, and for many locals, an Amsterdam brown café is an extension of their living room. “I have been coming here every week for years to catch up with friends and enjoy some apple pie,” says Willem Alexander. 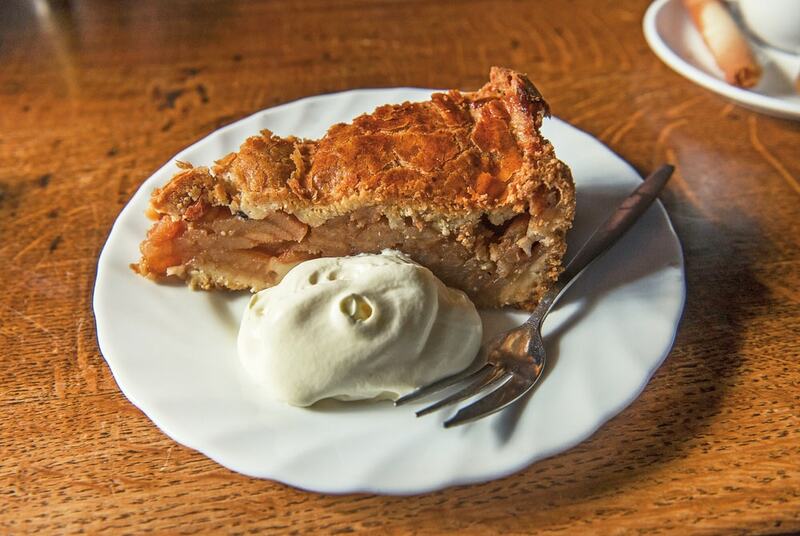 The Dutch have been making appelgebak, or apple pie, since the 1500s, and Café Papeneiland is one of the best places in town to sample it, as theirs is lovingly made from a closely guarded recipe handed down through generations. What separates Dutch apple pie from the others is the extra-thick crust and spicy filling of cinnamon, brown sugar, and raisins that help soak up the juices from the apples as the pie cooks. One famous Café Papeneiland customer was Bill Clinton, who enjoyed his slice of apple pie so much that he decided to take a whole one back home with him. A letter from the White House thanking the café’s staff is proudly displayed on the wall opposite the bar. We join the rest of the tour group around a wooden table in the corner to enjoy a slice of this iconic dessert, served with a large dollop of whipped cream and accompanied by coffee. It’s absolutely heavenly. Just around the corner from Café Papeneiland is Swieti Sranang or “Sweet Suriname” (Brouwersgracht 125), a humble-looking takeaway serving some great food from the former Dutch colonies. 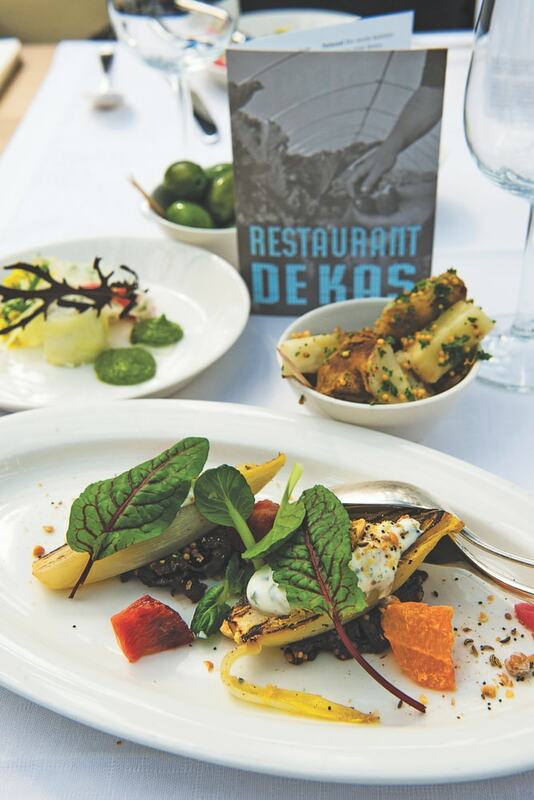 “Until a few years ago, Dutch cuisine wasn’t terribly exciting, but people from Suriname and Indonesia have brought their amazing foods with them, and restaurants can now be found on many street corners in most neighborhoods,” says Aileen. We all crowded eagerly inside to sample broodje pom, a Surinamese oven dish which combines three central ingredients: chicken, citrus juice, and pomtajer (a plant indigenous to Suriname) served in a bread roll, and baka bana, deep-fried plantain with peanut sauce. Next on the agenda is Louman (Goudsbloemstraat 76), an old-fashioned butcher’s shop which has been selling locally sourced meats—particularly sausages—for over 150 years. The ossenworst (smoked raw beef sausage) and grillworst (grilled sausage) are popular choices. Close by is the top-quality fishmonger Urker Viswinkel (Tweede Egelantiersdwarsstraat 13), which features the Dutch favorite maatjesharing (fresh raw herring cured in brine) on its menu. The usual practice is to take your herring by the tail and toss it whole down your throat, with your head held back, but the faint-hearted may prefer them in a roll or on a plate with chopped onion or gherkin. “There is a saying here that if you don’t try herring, you will regret it, and if you try herring, you will regret it,” says Aileen with a smile. If herring isn’t your thing, then try the superb deep-fried cod bites in beer batter, known as kibbeling. 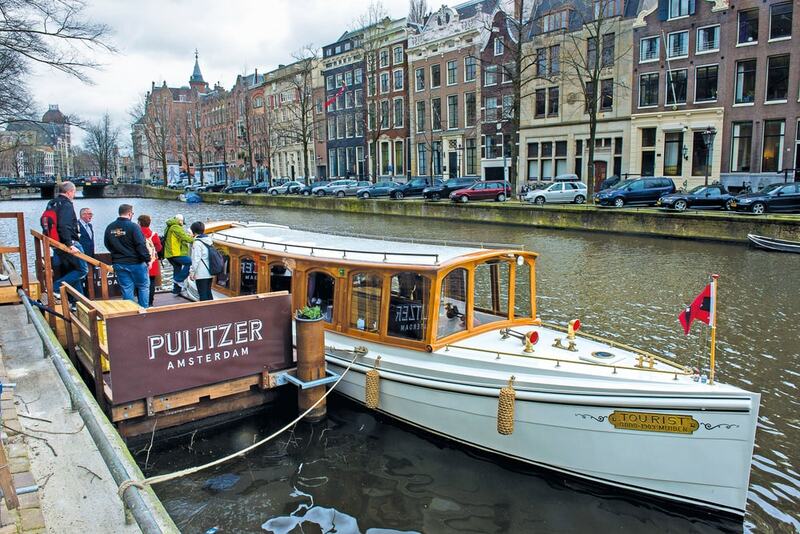 Another tour highlight is a trip through Amsterdam’s World Heritage canals on The Tourist, a beautifully crafted salon boat built in 1909, where we sample three types of cheese from De Kaaskamer cheese shop (Runstraat 7) paired with a bottle of wine. Next up is a portion of the quintessential Dutch bar food bitterballen (golden fried meat and potato balls that are much tastier than they look), alongside some superb local beers from the microbrewery Brouwerij ’t IJ. You certainly won’t go hungry on a Jordaan Food and Canal Tour, and my advice is to go easy on breakfast on the day of your tour. In the afternoon, we visited the amusingly named Wynand Fockink (Pijlsteeg 31) to experience the Netherlands trademark spirit, jenever, a fiery, juniper-flavored drink similar to gin. Located down a narrow alleyway just off Dam Square, Amsterdam’s best proeflokaal (tasting house) barely looks a day older than its 1679 origins. The quirky, cozy, and atmospheric interior is a cross between an old bar and a chemist shop where antique bottles perch on crooked shelves and old wooden barrels line the walls. 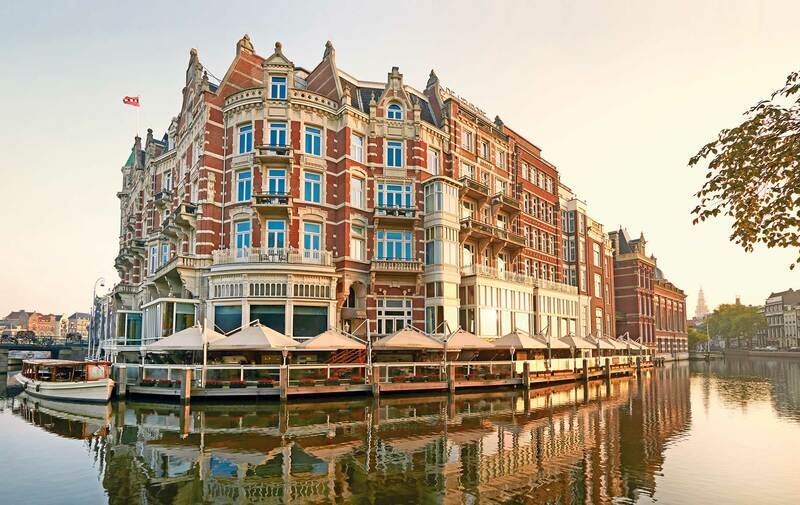 “This is the oldest still-producing jenever distillery and tasting room in Amsterdam,” says brand ambassador Joeri Remeeus as we survey the menu of more than seventy jenevers and flavored liqueurs available. There are two types of jenever: oude (old) and jonge (young), and different grains such as wheat, barley, and spelt are used in the production process. Jenever is traditionally served neat in a tulip-shaped shot glass filled to the brim, which obliges you to bend down to the counter to take your first sip hands-free or risk spilling your tipple. Wynand Fockink is open daily from 3:00 to 9:00 p.m., so make sure to drop by for a quick one and don’t be surprised if you find yourself leaving with a souvenir bottle or two. 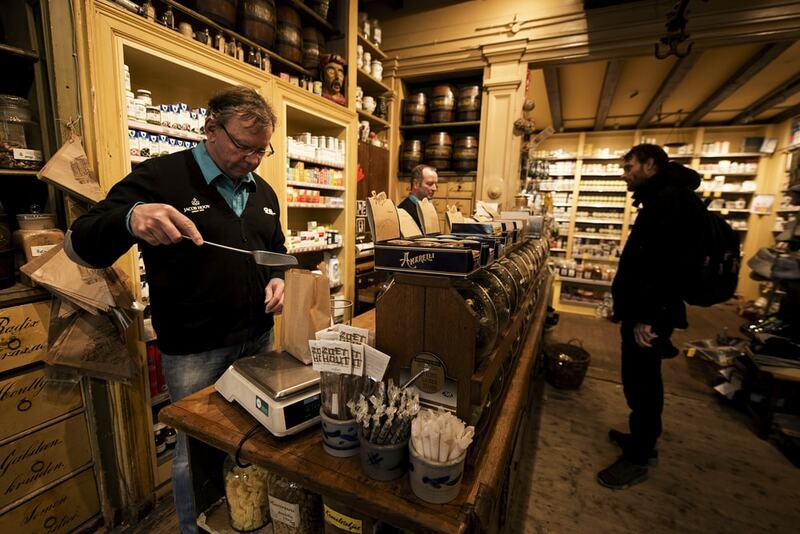 A few streets away is Jacob Hooy & Co (Kloveniersburgwal 12), a marvelous store that began life as a pharmacy in 1743. Its beautiful antique interior of worn wooden floors and cabinets looks much as it did back then. Although it specializes in supplements, teas, homeopathic remedies, and herbs, the best reason to visit is the excellent selection of Dutch licorice. Aficionados of the black stuff will think they have arrived in heaven here, with sweet and salty licorice available, both soft and firm and in a variety of shapes. 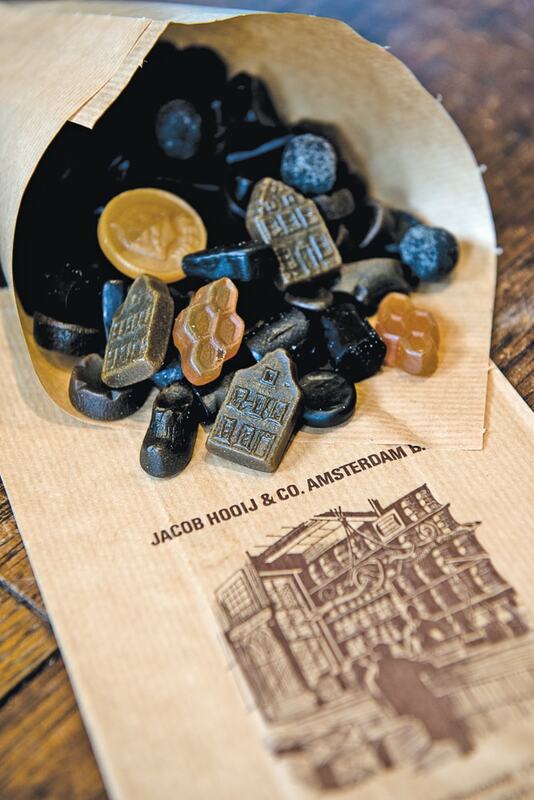 The Dutch refer to salty licorice as zoute drop or dubbel zoute drop (double salted licorice). On the wooden counter are some scales where the confection is weighed out “pick and mix” style, then scooped into brown paper bags in an age-old manner. Make mine a big bag, please. The next morning, we headed out to the trendy De Pijp neighborhood to visit Albert Cuypmarkt, the biggest and most popular outdoor market in the Netherlands, operating since 1905. Over 250 stalls, selling everything from clothing and flowers to fresh vegetables and a smorgasbord of Dutch specialties, are set up down one very long street. Cheese stalls bulge with Gouda, Edam, and Friese nagelkaas, a clove cheese that became popular when spices were first imported in the seventeenth century. Another stall sells poffertjes; a traditional Dutch batter treat dating from the Napoleon era. 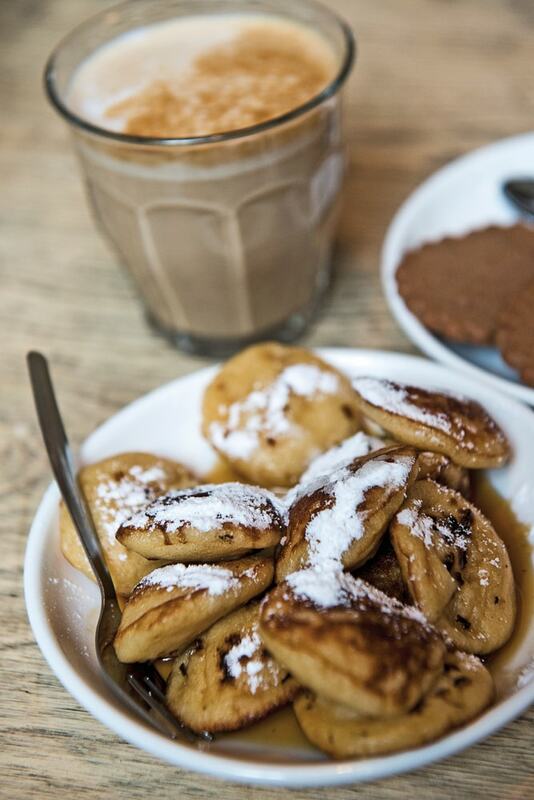 Made with yeast and buckwheat flour, poffertjes resemble small, fluffy pancakes and are typically eaten with butter and sugar. While you wander the market (open Monday to Saturday from 9:00 a.m. to 5:00 p.m.) keep an eye out for a food van with the sign “Goudse Stroopwafels,” which sells another favorite Dutch treat, the stroopwafel. First made in the city of Gouda, a stroopwafel is a waffle made from two thin layers of baked dough with a caramel-like syrup in the center, and Goudse Stroopwafels are said to be the best in Amsterdam. 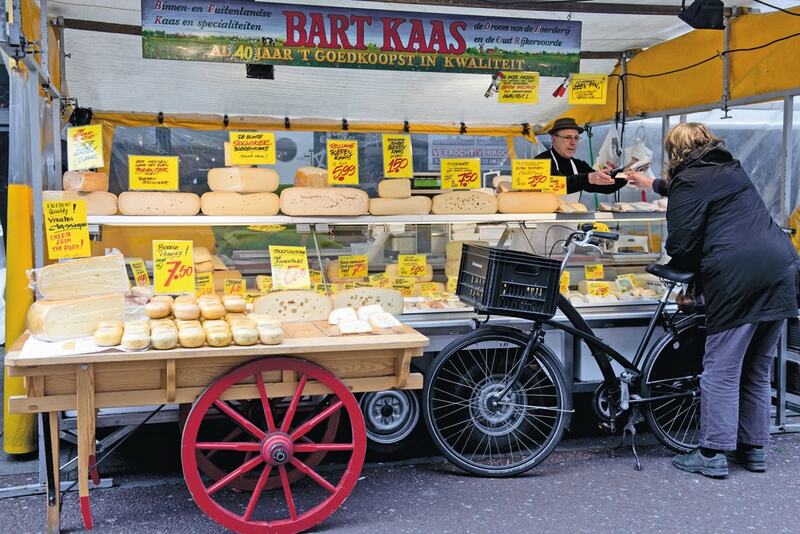 Another top foodie destination is Boerenmarkt, Amsterdam’s organic Saturday farmer’s market, where, to the accompaniment of some fine busking, you can cruise the various stands offering goat cheese, Dutch meats, freshly baked breads, and fabulous fungi. It’s worth mentioning that close to the start of the Albert Cuypmarkt is Warung Spang Makandra (Gerard Doustraat 39), an authentic diner serving typical Surinamese and Javanese dishes. Try the roti chicken, Javanese soup (saoto), or the house special of fried rice, stir-fried noodles, chicken fillet in soya sauce, chicken skewer with peanut butter sauce, sliced Surinamese long beans, fried egg, and deep-fried mashed potato ball with herbs. Also in the area is Afoe Censie (Gerard Douplein 12), a Surinamese grocery bursting with exotic fruits such as durians, papayas, mangoes, and coconuts. With a rich brewing tradition and household names like Heineken and Grolsch, it’s no surprise that the Netherlands’ number one bar drink is beer. In Amsterdam in recent years, there’s been a trend toward craft beers, with brewpubs and microbreweries popping up all around town. In the afternoon (all in the name of research, of course), we took a tram trip from Central Station to check out the microbrewery Brouwerij ’t IJ (Funenkade 7), situated in the east of the city. 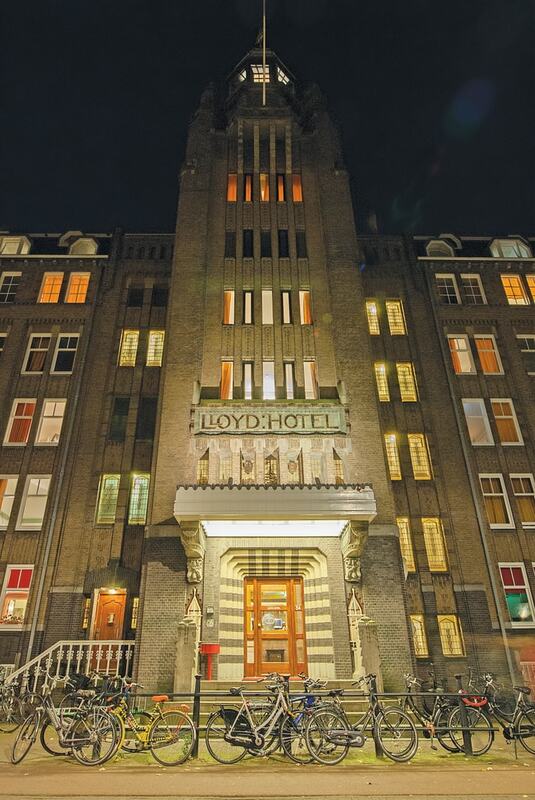 Adjacent to the landmark 1814 De Gooyer windmill and set within a former 1950s bathhouse, this is one of Amsterdam’s best-loved microbreweries. 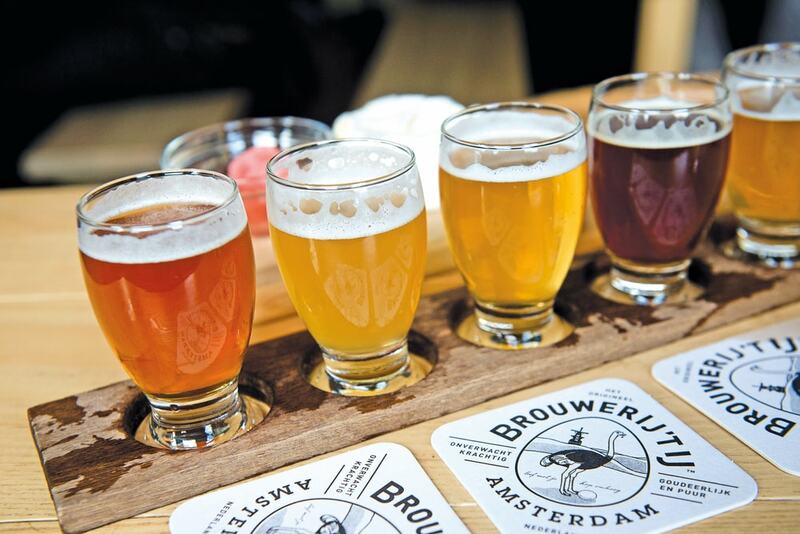 “Beer has been brewed at Brouwerij ’t IJ for over thirty years, and it’s very popular with locals and tourists alike,” says director Patrick Hendrikse. “There’s no music here; it’s all about the appreciation of beer in relaxed, sociable surroundings. We offer four organic beers on tap, one-off brews, and bottled beers in a range of styles and strengths.” Menu selections include Zatte (a smooth-flavored tripel with hints of fresh fruit and grains), Natte (a dark, smooth Belgian-style organic dubbel) and Struis (an English-style brew with a deep, dark color and full of malty flavors). Each is best enjoyed alongside some Skeapsrond, a soft organic sheep’s cheese from Dikhoeve farm in Ransdorp, about ten kilometers outside Amsterdam. The sheep that provide the milk for the cheese are fed on malt dregs left over from beer making at Brouwerij ’t IJ—a perfect example of full-circle synergy in action. The brewery is open daily between 2:00 and 8:00 p.m. and allows you to combine top-notch beer tasting with some classic Dutch scenery. Definitely recommended. 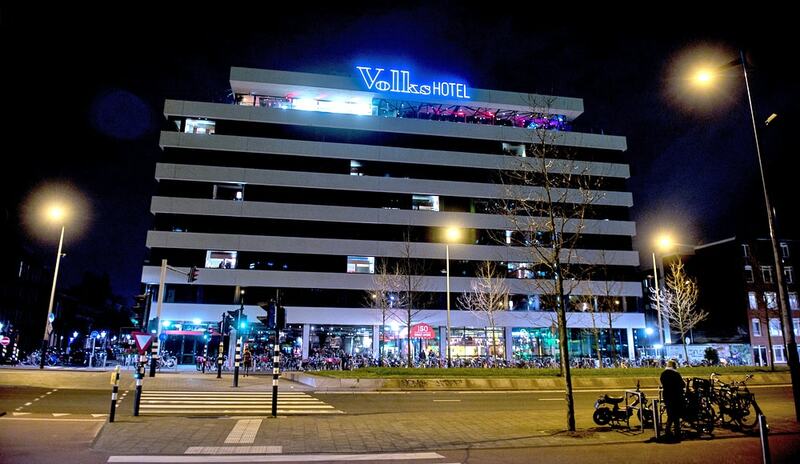 There are plenty of other excellent places in Amsterdam for beer aficionados. 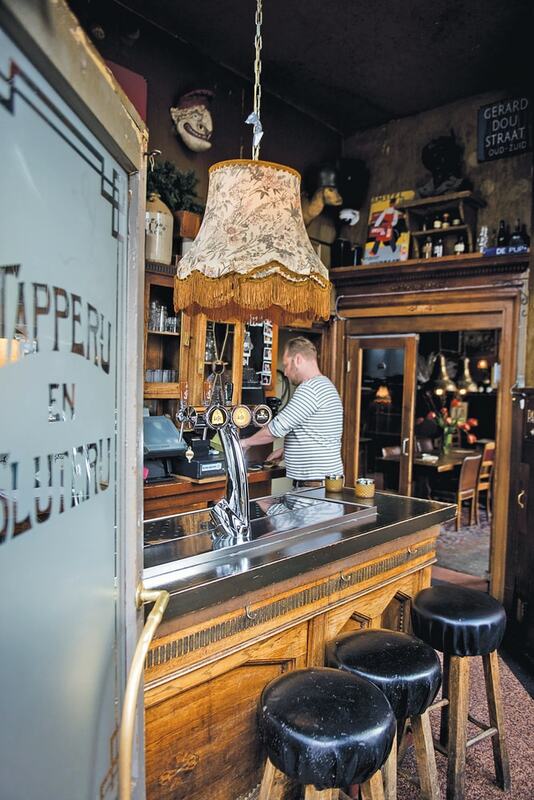 The ’t Arendsnest (Herengracht 90) distinguishes itself from other city bars by serving only Dutch beer, with over 350 varieties from fifty breweries and microbreweries. Tasting sessions are held downstairs where you can learn about the history of beer and the brewing process. Other places worth a visit: Craft & Draft (Overtoom 417), Butcher’s Tears (Karperweg 45), Bierproeflokaal In De Wildeman (Kolksteeg 3), De Bekeerde Suster (Kloveniersburgwal 6)—a brewery set up by nuns in the fifteenth century—and the bottle shop De Bierkoning (Paleisstraat 125), which has almost a thousand beers. When it comes to restaurants and cafés serving typical Dutch cuisine, they can be quite tricky to find, as many Amsterdammers like to eat something different than their home cooking when they go out. 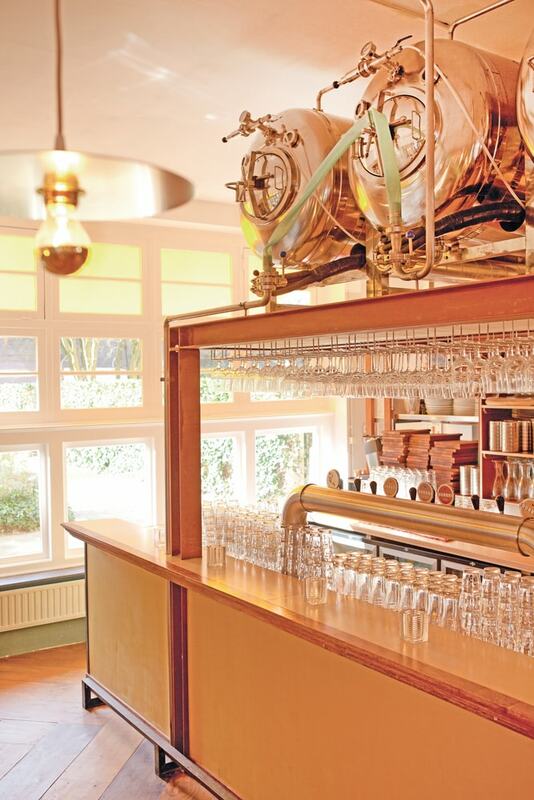 A fine example is Moeders or “Mothers” (Rozengracht 251), a quirky restaurant with a vintage vibe serving Dutch classics. 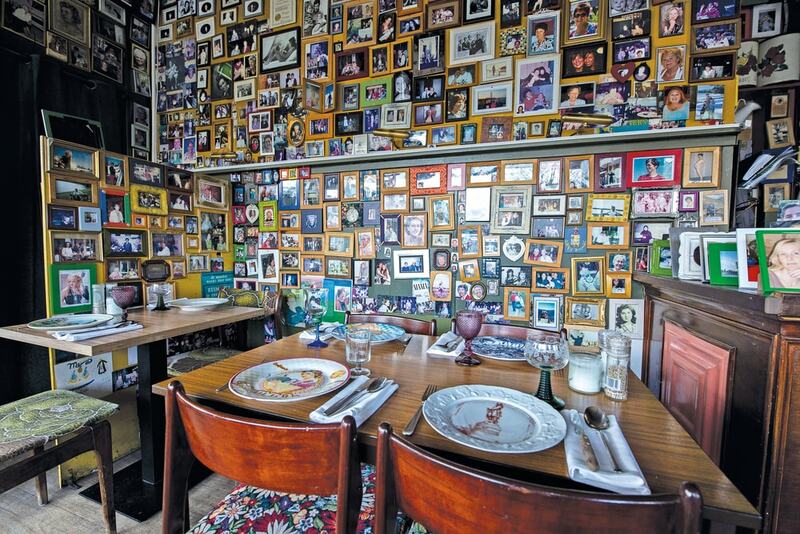 Inside, photos of mothers brought in over the years by customers adorn most of the wall space—and none of the china, cutlery, or glasses match. This represents the odd kitchenware one might find in their mother’s cupboard. 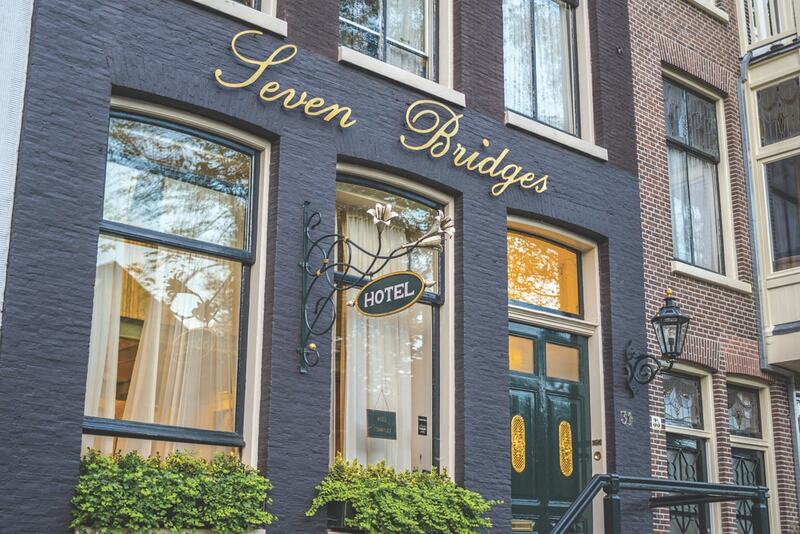 The homely Bistro Bij Ons (Prinsengracht 287) and the elegant De Silveren Spiegel (Kattengat 4–6), housed in a seventeenth-century building, are two other restaurants keeping the traditions of the Dutch kitchen alive. Some of the typical hearty dishes served in these restaurants are hachee (a Dutch stew based on diced meat and vegetables), erwtensoep (pea soup), gerookte paling (smoked eel served with white toast and a squeeze of lemon), and stamppot boerenkool (mashed potatoes and red cabbage flecked with chopped bacon and smoked sausage). If you’re looking for home-cooked food with a truly personal touch, then “living room restaurants” offer a brilliant alternative to traditional dining. 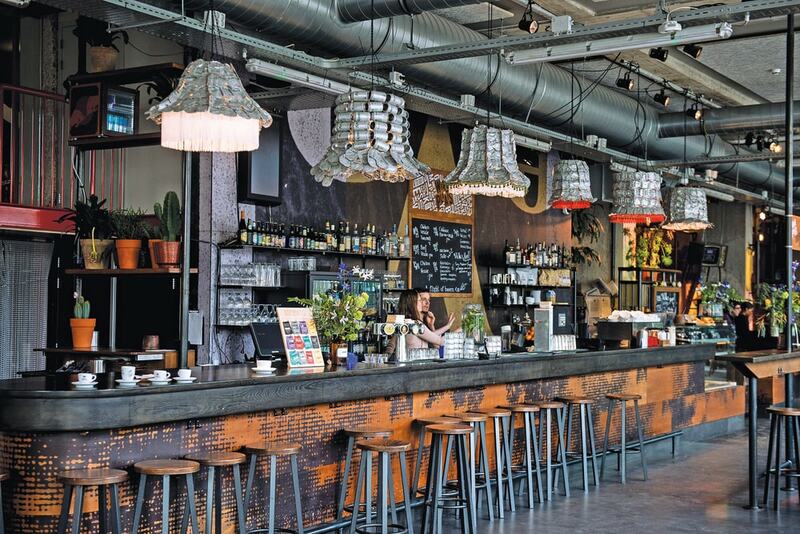 Living room restaurants are a rapidly blossoming trend in Amsterdam and provide a great opportunity to meet new people, enjoy fantastic food in the chef’s home, and immerse yourself in the local culture. 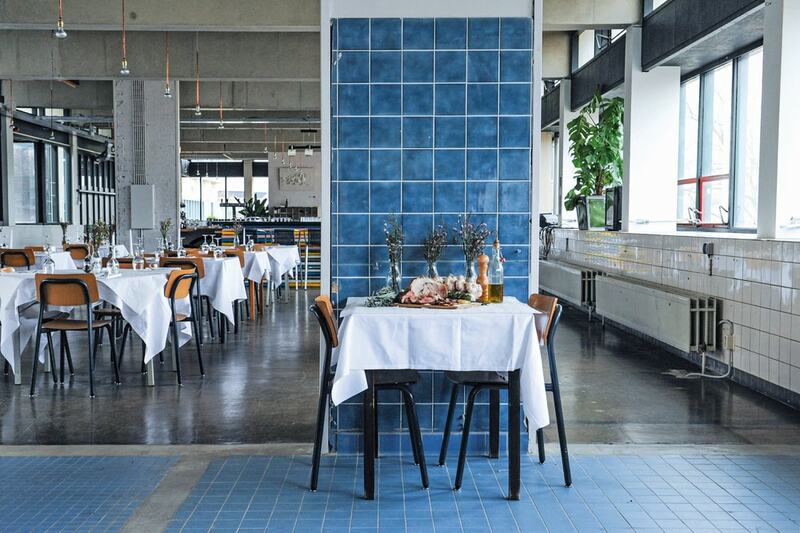 On our final day in Amsterdam, we had lunch at the stunning greenhouse restaurant De Kas (Kamerlingh Onneslaan 3). The glass building dates back to the 1920s when it was used as the city’s municipal greenhouse, and it still retains an old-fashioned charm despite its conversion into a superstylish eatery. Locally sourced meat and line-caught fish complement the organic vegetables, herbs, and flowers grown on-site. The three-course menu, prepared by head chef Bas Wiegel, changes with the seasons and depends on what’s picked from the garden each day. And you can’t get much fresher than that.